See some of our solar system's greatest sights, as captured in "Planetfall: New Solar System Visions," a large-format book by Michael Benson. Spacecraft engineers may not think of themselves as artists, but in the right hands, the fruit of their labors can be as artistic and as revolutionary as Leonardo da Vinci's anatomical sketches — as evidenced by the stunning views on display in Michael Benson's "Planetfall: New Solar System Visions." "It's an amazing thing that in the last 50 years, we have expanded the realm that's accessible to us either directly or indirectly as a species," Benson told me. "As a result, we have a new chapter in image-making and photography. In a way, this brings science and art together, as it was in the Renaissance." "Planetfall" presents more than 120 images of solar system bodies ranging from our own home world to the sun and moon, Mars, Jupiter, Saturn and asteroids and comets — all in a whopping 12-by-15-inch (30-by-38-centimeter) page format. Some of the photos stretch out over double-folds, triple-folds, even quadruple-folds (which translate into roughly 5-foot-wide panoramas). To create the photos, Benson went back to the raw data from NASA and European Space Agency missions. "It's a point of pride to build most of these images from the ground up," Benson said. Benson, a writer/filmmaker/photographer, has done this before. His earlier books, "Beyond" (2003) and "Far Out" (2009), presented imagery from planetary probes and deep-space views, respectively. At first, Benson thought he'd just update the "Beyond" book for a new edition. "But then I thought it would be fun to change the format of the pages, and simply look at 21st-century planetary photography — because we really have had a renaissance of these missions in the past decade," he said. For the book's title, Benson used a word that capitalizes on the concept of an explorer making landfall. "Planetfall" is defined as the moment when visual contact is made with a celestial body. Following through on that theme, the book is structured as a series of movie-like journeys — beginning with an establishing shot, then moving in for glorious close-ups. The section on Mars starts out with a long-range view of the Red Planet from ESA's Rosetta probe during its flyby on the way to a comet encounter. "It's one of the very rare pictures where you see a planet with the Milky Way behind it," Benson said. The point of view zooms in to reveal the terrain as seen from orbit, including a marvelous shot of ground fog lying at the bottom of a Martian canyon, as seen by ESA's Mars Express probe (page 100). Then there's that stunning series of panoramas from NASA's Mars rovers, ending with a blue-tinged sunset as seen by the Opportunity rover. With only a few exceptions, Benson tries to come as close as he can to the view that human eyes would see, which sometimes requires some tricky image processing. 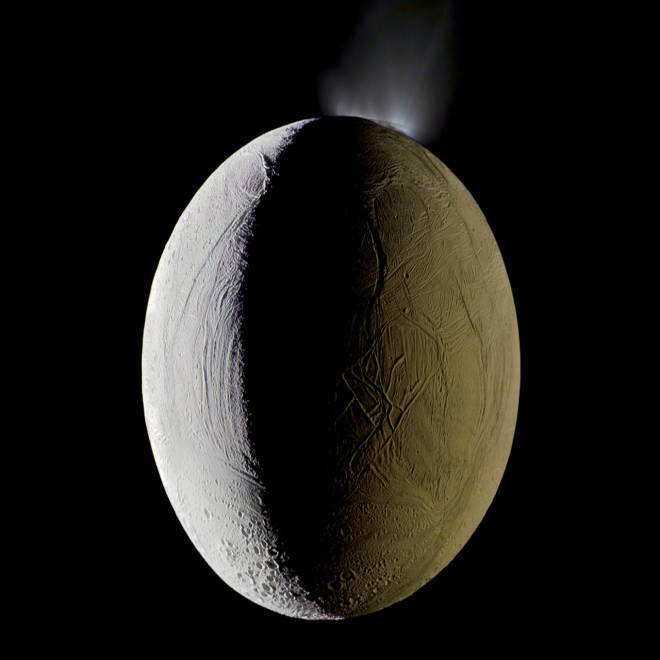 For example, a picture of Saturn's geyser-spewing moon, Enceladus, is based on image data from the Cassini orbiter in infrared, green and ultraviolet wavelengths. Benson said he tweaked the data to come up with a red-green-blue combination (page 187). "I think I got away with it pretty well," he said. "It makes a very worthy color image. ... To my knowledge, it's the first time that a global portrait of Enceladus has been released where you see the geysers in color." In addition to the book, which is published by Abrams, Michael Benson is working on a "Planetfall" photo exhibition that will be on view at New York's Hasted Kraeutler Gallery starting in December, and at the American Association for the Advancement of Science in Washington next year. So how does Benson's work sit with planetary scientists? "Obviously everybody's worried about the funding [for future planetary missions]. Anything that can get the word out about these missions is good by them," Benson said. He's also heartened by an endorsement from Paul Geissler, a planetary scientist at the U.S Geological Survey who has collaborated with Benson in the past. "He has an artist's eye, so he sees things differently than a scientist would," Geissler told The Wall Street Journal last year. "I honestly think that he has done as much to support and further solar-system exploration as many scientists who are working in the field." Benson said he has just as much respect for the scientists who make his artistry possible. "We have a fantastic chapter in the history of photography that has been brought to us, almost as a side effect of these missions," he told me. "Their primary reason for happening is scientific research, but we also have this opportunity to see what these places look like. I believe we will inevitably end up expanding as a species. It may take longer than the visionaries of the 20th century thought, but I do believe it will end up happening. This is still the opening chapter: We're seeing the end of the beginning of that move." Update for 5 p.m. ET Oct. 19: I originally wrote that Benson coined the term "Planetfall," but commenters have rightly pointed out that the term has been around in science fiction for quite a while, meaning the interplanetary equivalent of landfall. In fact, it was picked up as the name of a computer game in the 1980s. Benson tweaks the meaning a bit, using it to define a visual discovery rather than an actual landing. I've revised this item accordingly.